Well kiddies, it was bound to happen, I jumped onto the sous vide trend-wagon. See, here is what happened: after our wedding, Nicole and I had a pile of Williams Sonoma gift certificates burning a hole in our pocket. Our kitchen is already stocked to the brim and there was nothing else we needed from good old Chuck and company. Nothing except for the shiny Sous Vide Professional sitting on the shelf staring at me. Mocking me. Those gift cards and a little dip into some AmEx points took care of that problem. Who’s the boss now Mr. S.V. Professional? OK, so now what? We have this super crazy expensive piece of lab equipment that I need to use, especially now that Mrs. Jew is starting to monitor the household finances. It’s grape harvest season and weekends have been consumed with cleaning, de-stemming, and pressing grapes. It wasn’t all work with no play as we have thrown in an appropriate amount of tasting too! Finally we had a pretty clear day on Halloween, so we decided to use the opportunity to jump right into the sous vide hot tub. 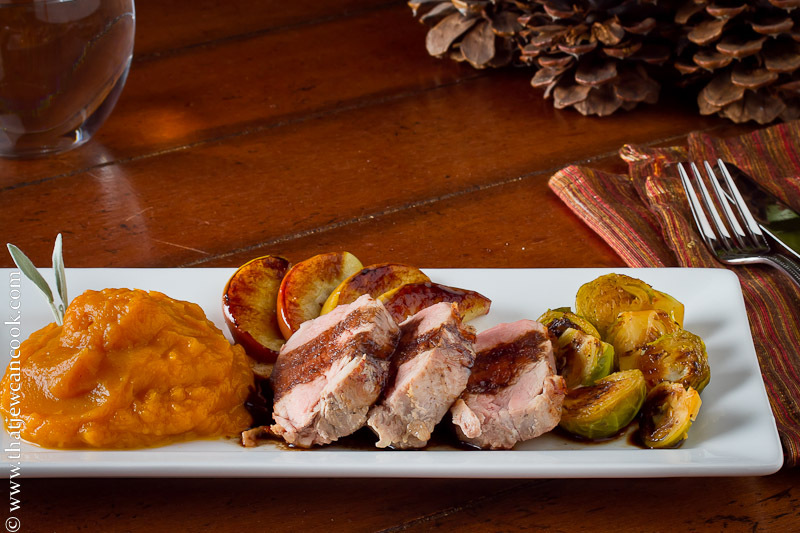 We chose to make a replica of a dish from one of our favorite restaurants: pork loin with caramelized apples, brussels sprouts and butternut squash puree drizzled with balsamic syrup. If this doesn’t have fall written all over it, I don’t know what does. As you can see from the picture, not a bad first attempt. It certainly isn’t as pretty as the restaurant version, but taint no slouch either. I was a little nervous about sous viding, so probably went a little overboard on the temp for the pork: 148.1F deg. for 90 minutes. The pork was definitely cooked with a nice light pink throughout. You may be able to see it in the pic a little bit under all that sticky balsamic goodness. For those new to sous vide, a quick definition might be in order. Sous vide is French for ‘under vacuum’. Simply put, you vacuum seal your food, and place it in a water bath set to the final temperature you want to reach. E.g. for a medium rare steak you’d make the water between 130-140F degrees. Sous vide is pretty forgiving since you can’t overheat your food. Tough cuts of meat such as short rib will need a really long time to break down at such a low temperature and it isn’t unheard of to cook food in there for 24 or more hours! There are a few downsides though: food comes out of the bag looking pretty pallid, so you still need to quickly sear it to give it a nice outer crust. The other downside is food safety, there are a lot of gotchas, so you should do more research before trying it yourself*. Some of the big names in cooking have been pioneering sous vide for years and you’ll hear about Thomas Keller and Heston Blumenthal quite often in this context. You’ll also see it used on Top Chef when someone is trying to show off. It turns out to be a very effective technique for restaurants, so I am sure its happening quietly in a lot of places. Nathan Mhyrvold, a big ex-Microsoft scientist has put together a definitive tome on sous vide and molecular gastronomy that is sure to be really valuable. Too bad its like 5 volumes, over 1,000 pages and 500 buckeroos ! Maybe one of you dear readers can send one to me. I also haven’t gotten Thomas Keller’s book, as his recipes require too much work for me. There has been a lot of equipment released to help cook sous vide. 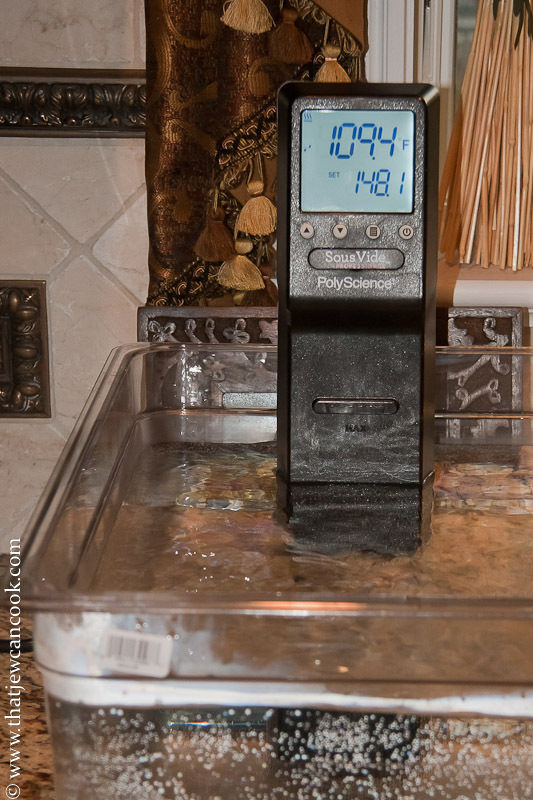 The most common method to keep your water bath at a constant temperature is called an immersion circulator, or another device called a water oven. You don’t need a fancipants set of tools to sous vide, the way I learned was in a cooking class where they did it ‘ghetto style’ using a pot, a candy thermometer and a lot of ice to regulate the temperature. The equipment just makes it neater and easier. By the way, this was much more work than I am usually prepared for. When I cook, I like ’em simple with one or 2 pots at most, but this thing took over our kitchen and filled the dishwasher (well technically I filled the dishwasher). How is it possible that a dish taking around 2 hours to make gets demolished in like 7 minutes flat? Burp. All in all, we considered this a smashing success. The pork was moist and tasty, and Nicole was happy. Now we only need to sous vide like a thousand more times to make it cost effective! Note: You should time everything so its ready at once. I steamed the squash right when I put the pork into the bath, and then did the rest 20 minutes before the pork was ready. When sous vide is done, it’s done and needs to be eaten right away before all kinds of cooties grow on it. One nice sized pork loin, enough for 4. Kept refrigerated. Heat up your sous vide to 148.1 degrees (the .1 is because I can). Vacuum bag the pork (wrap that rascal, will ya?) with the rest of the ingredients and leave it in the bath for 90 minutes or so. Remove from bag and immediately brown all sides of the pork loin in a frying pan with a little oil. Steam the squash until soft, then blend everything else in a food processor adding enough stock to make it smooth. Saute the brussels in a pan with a little butter. When nice and toasty looking, add a little lemon juice to preserve the color, add the broth and cover until they are tender. Remove cover and boil off remaining liquid. 1 or two apples peeled and diced. Peel and dice the apples, tossing in lemon juice to keep ’em from turning nasty. You’ll notice that I didn’t peel or dice mine, in retrospect I should have. Saute the apples in butter until nice and carmelized. If you really want to sweeten the deal you can add a little brown sugar. In a small pot, reduce balsamic until it starts to thicken up. Watch out that it doesn’t burn. Let cool for a few minutes and use to drizzle on the dish. I didn’t let it cool, so in the pic it ran all over the place. No worries, it still tasted great! *TJCC Legal disclaimer: If you go and poison yourself due to improper sous vide technique, that’s your fault, not ours. We aren’t paying for your Pepto, hospital bills, nor a funeral. Please read up and practice proper sous vide technique, take 2 aspririns and call us in the morning. I can’t wait to try this entire meal! It will have to wait until after my parent’s 60th wedding anniversary this coming weekend. Everything else is. Hey Val, yes it was pricey and I am still not sure I can justify the cost. It did come with the plastic tub and a 22 quart pot (which hasn’t come out of the box yet). This seems to be a special promotion WS is doing (probably because no one in their right mind would buy this). It should come with a massage too. The plastic tub doesn’t have a lid, but the unit has been able to keep up the heat. I imagine it would be more energy efficient with a lid. Let me know if you make it, am interested to see what tweaks you apply to make it better! I was just going back to copy the recipes – when I thought I read all and came to your disclaimer. What a hoot! How the heck did I miss this post? You don’t have to be clear on this purchase you used your gift cards- your friends would be proud. Your foodie friends are envious. It will never occur to me to tackle such an endeavor-So, let me get this right, you cook your meat in an ice bath? Holy cow ( I would use another word other than ‘cow” but this is a family friendly blog 🙂 ) That is utterly amazing. Fun stuff if you get the chance and there is other equipment that is more economical (see Sous Vide Supreme)…. Andy, while your meal sounds deeeeee lish, is it worth the extra fiddlyness and the space of ONE MORE THING in the kitchen? I’m not trying to be snarky but seriously asking…how many times would you do this? And are the results that much better than other methods? Thanks! PS: Aren’t gift cards grand?! La Diva — no need to feel snarky as I am channeling a similar tone. I love the idea of sous vide, and the texture and taste it imparts food is really cool, but in the end I don’t think I can justify it. I don’t make those kinds of meals often enough and I tend to be a one-pot meal kinda guy. As you can see from my postings — I make *good* fun food, but I don’t really make gourmet food, which IS too fiddly. I also am a bit of a spontaneous cook, so making a 36 hour shortrib recipe seems a bit foreign and weird to me. I do have some buyers’ remorse, and there are cheaper implementations than the one I purchased. I specifically went for the model I did because it fits nicely in a drawer and I usually feel better if I buy the best of class! I think the Sous Vide Supreme Jr. (its not called that abd it is less than 1/2 the price) may have been more appropriate for me. Anyhoo, water under the bridge (warm circulating water at least) and now I NEED to try and use it, and use it often. Wow I’m so glad to hear your answer, Andy, we are two peas in a pressure cooker! haha! I don’t like the over fiddly food, preparing it or eating it, much prefer simple foods, that why I love stir fries. I love that some people are so talented and great at that but it will scare most beginner and intermediate cooks off and that’s whom I like encouraging. Thanks for your honesty, the dinner looks divine! I guess you can do this sort of stuff on the weekend? Or sell on ebay? Agreed stir fries, soups, stews — that’s my bag o’ peanuts 🙂 But I will keep the sous vide thing, as it is cool and I want to try it once in a while. Now that I am cooking for two it seems more justifyable to make more complicated meals, especially since Nik (aka Mrs. Jew) helps me clean up! A friend of mine gave me a Kuhn Rikon pressure cooker he received as a gift from his mother. He never used it and said he never will. Unfortunately, he couldn’t find the user’s manual or any recipe book. Do you know of a site that might help me? PS: Love your post on Sous Vide. I’m a fairly new user myself. Great dish! Been a sous vider for a while and pork tenderloin is great! Am going to try your dish this weekend! Andy, I’ve had a Sous Vide Supreme Demi now for several months. I live alone but love to cook, and this gadget, although a one-trick pony, is perfect for my style. I like to get everything for dinner going, pour a cocktail or two and start a movie. With the sous vide method, I can eat whenever I want–no watching pots boil, etc. The demi cost me $300, but the fact that I don’t need to monitor the temp is worth it. And putting a quick sear on a steak is easy. Throw in a salad and some roasted veggies and this is truly a no fuss meal. Just found your site and am loving it! This is a great use of sous vide, set it up and chill out with a beverage! Got any good recipes to share?